There was a time when those who wore the Decepticon badge did so with pride, and not fear. There was a time when the name of Megatron was honored by many across Cybertron. He was a scholar, a warrior, and a hero, fighting for the freedom of the oppressed. But power inevitably corrupts, and none are so powerful as mighty Megatron. Long ago, he forgot he was a hero, and became nothing more than a tyrant. Megatron. Transformers and humans alike tremble when hearing that name (with the exception of Rosie Huntington-Whiteley who apparently is the only one with the guts (stupidity?) to climb on his leg and call him a b****). Megs is a classic character, and the second constant in the world of Transformers, right behind Optimus Prime. There are too many Megatron iterations that have come out over the years, so I won�t even bother to recap. If need be, you can look it up on TFWiki. Most of the time, any Classics/G1 styled Megatron turns out as a gun, tank, or some form of mobile artillery. Maybe that�s what makes this figure special. 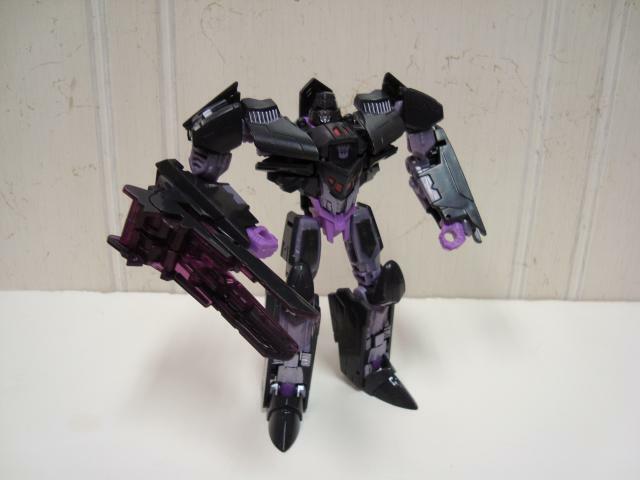 Following the design of IDW�s Spotlight series, this version of Megatron is a stealth bomber. That�s one of the reason�s I picked this one up, and also to stand next to my RTS G2 Laser Optimus Prime. In my opinion, this version of Megatron is done well, and is a welcome change from a silver/black/red (or light gray, purple, and green if you�re a US Classics Megatron) gun/tank/artillery unit. Most of you will want to know if the mold itself is worthy of your cash. Let�s find out!!! Megatron�s IDW alternate mode is a stealth bomber based on Don Figueroa�s design. The stealth bomber is primarily colored in black/gunmetal grey with some metallic purple vents on the wings, silver vents on the front, a grey nose, red windows, and a purple front landing gear. Molded detailing is minimal in this mode, but there are some panel lines here and there. The �lack� of molded detail is appropriate for a stealth bomber, which is designed to be sleek and aerodynamic. The mode is sturdy when tabbed all together, and surprisingly solid considering the general hollowness of the robot mode. Some of the robot parts can be seen on the underside of the bomber, but it�s really nothing noteworthy compared to something like Generations Thunderwing. We�re definitely not talking robot tacked on the bottom of a jet. All the robot mode parts are tucked away rather well, and the bomber ends up looking sleek in the end. There aren�t really any features to speak of, it�s just a well done bomber mode that is sturdy, compact, and sleek. I have no complaints here. After a rather simple transformation (nothing frustrating nor fiddly), Megatron appears in a slender, yet imposing robot mode. The robot mode nails the design set forth by Figueroa. By the pictures, it�s easy to see where all the bomber mode parts ended up, so I won�t go into heavy detail. 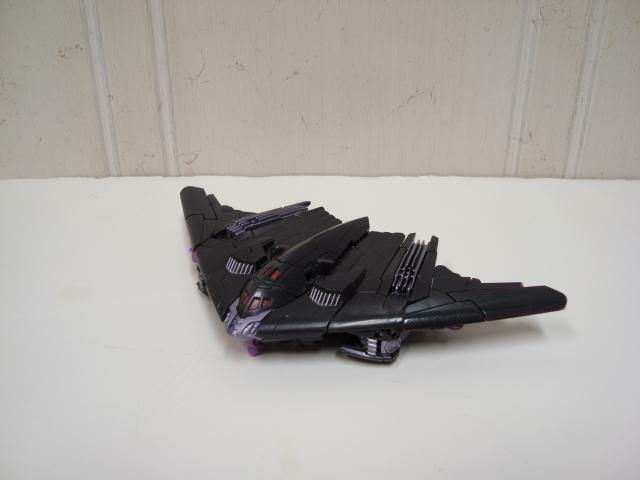 The wing tips of the bomber mode snap together via pegs to form Megatron�s fusion cannon, which also slides back and forth via a �handle� on the top to both lengthen the cannon as well as show some more of the transparent purple used on the wing tips. The cannon can be attached to either forearm using a 5 mm peg, or if you�re feeling froggy you can have him hold it in his hand (it just doesn�t look like Megatron doing it that way!). The color scheme remains the same with black/gunmetal making up the majority. More light purple is visible on the pelvis, hands, and shins. The upper arms and legs are made of a light grey that seems to have a slight purple tinge to it, and there�s a purple Decepticon symbol visible on Megs� chest. The head mold is well done, though the light piping leads a lot to be desired. Whereas many recent figures don�t require a significant light source to get the eyes to glow, you may need a spotlight (see what I did there?) right on the back of his head to get them to go. I haven�t been able to get his eyes to glow using normal lighting, and I haven�t tried a heavy source of light. It�s completely possible the piping is black, I just haven�t looked that hard at it. As for articulation, Megatron has it all over. Elbows, upper arms, shoulders, knees, thighs, and hips all twist well, and nothing is terribly hindered. The ankles only swivel up and down, but different stances can be pulled off by modifying his heels. There isn�t any waist joint to speak of, and the neck joint on mine is rather tight. It�s not a huge problem, but Megs� tiny head makes it difficult to get in there with adult fingers to twist it. Overall, Megatron�s robot mode is well done. On a final note, this version of Megatron is quite fun, and at least this time he transforms into a unique vehicle (i.e. not a tank), but is also realistic in alt mode (i.e. not an overly large gun, goofy artillery unit, or Cybertronian/futuristic vehicle that passes for a �jet�). At $15 USD, he may be overpriced. I paid $13 USD for him, and don�t regret it. If you�re looking for a G1/Classics-type Megs in the deluxe class size, this is the one to go for. If you�re just looking for a fun toy with two great modes, this one won�t disappoint. Transformation Design: 8. Not too hard, not too fiddly. Everything from robot mode tucks in well to form a compact bomber. Nicely done. Durability: 7. He�s not going to crumble in your hands, but some parts feel a little light. Aesthetics: 10. A great design and look in both modes. Sleek and without kibble. Articulation: 8. Megs has a decent amount of joints, and nothing is hindered. Could have benefitted from different ankles though. Value/Price: 9. A fantastic looking piece, imposing yet slender. Both modes are great and it�s Megatron! Overall: 8.5. There really isn�t anything I find wrong with Megatron outside of a few quibbles. Two great modes, good fun, and a great look. Do you absolutely need him? Probably not. But if you feel like dropping the cash on him, you will find a lot to love.